Remember that trade signal I got a couple weeks back on my HLHB system? When the signals lined up, I was able to enter a long trade at 1.2515, with a stop at 1.2365. I hit my first profit target at 1.2665 and got a 0.5% gain on my account. Whee, that’s 150 pips for me! 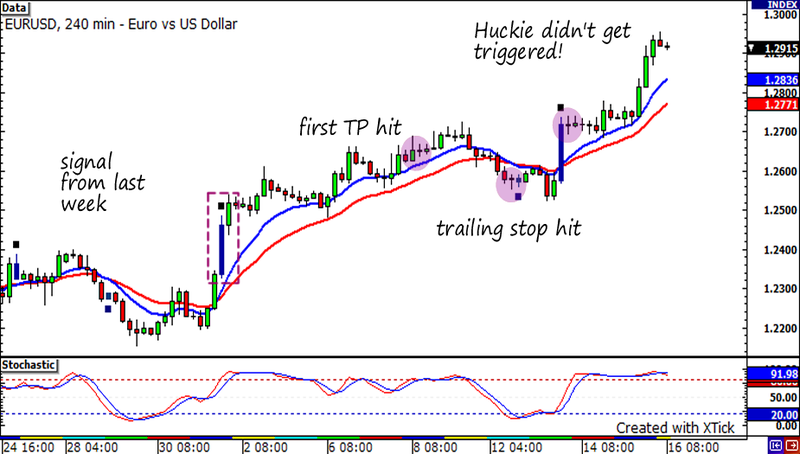 I left my second position open, with a 150-pip trailing stop. That position got closed out when the trailing stop was hit at 1.2492, leaving me with 59 more pips in the bag or roughly an additional 0.2% gain. Overall, that’s a 0.70% gain from my HLHB system. Ah well, this week yielded no signals on my HLHB system. I did get a couple of crossovers though but the other indicators didn’t line up for a long or short trade signal. The first crossover took place early in the week but the stochastics were already in the overdone region and the 30-pip filter wasn’t reached. That was actually a good thing because the market was pretty choppy then and I would’ve gotten stopped out anyway. Later on, an upward crossover took place, with the stochastics still crawling up. I kept my eyes peeled, waiting for the next candle to hit my 30-pip filter… but it didn’t! The pair’s movement was a bit indecisive for the next couple of days before it surged strongly yesterday. Unfortunately, I didn’t have a long trade open. Even though I feel a little bummed out that I wasn’t able to catch some pips off that nice rally, at least the HLHB rules kept my account from getting clobbered in this choppy market! As for the euro, well, let’s just say its future is looking very very bright! The currency found a lot of support this week because of the successful results of the Greek and Spanish bond auctions. It also managed to draw some strength due to a slight case of risk appetite earlier in the week. So that wraps up another week of Forex trading for me. Now that the World Cup is over, it’s time to hit the cinemas yet again! I’ve been hearing rave reviews about Inception. This doesn’t surprise me at all – Leo Di Caprio is the BOMB actor! He’s so talented! Thanks for reading my blog! You can also follow me at MeetPips.com!